When pruning shrubs they should retain their natural form as much as possible. So by carefully assessing which branches to remove it should be possible to achieve this. 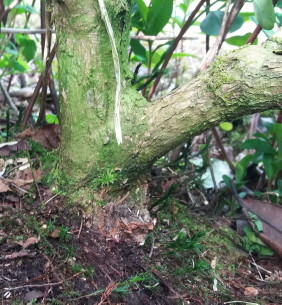 Choose a branch which is protruding most and holding it, reach down to where it arises from a main stem and cut without leaving a spur which will probably die back and could introduce disease. Do this around the shrub to give a balanced effect, standing back occasionally to check progress. Attacking a shrub with hedgetrimmers will leave an unsightly mess in most cases and will lead to the loss of any blooms. The resulting dome will produce a tight network of branches like a hedge without the natural looseness of an unmolested shrub. In some cases a hedgetrimmer is a quick way to remove all of the branches at the base after flowering, as with a Spiarea japonica 'goldflame' which will produce new growth that blooms in late summer. 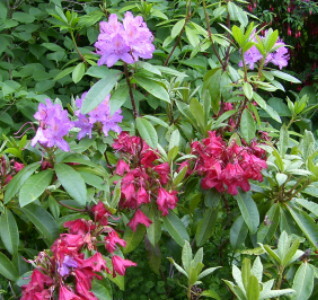 This keeps the bush compact and the fresh growth has better leaf colour. Timing is very important, especially with flowering shrubs as the future blooms can be removed. A general rule of thumb when pruning is to prune just after flowering so the plant has time to grow new shoots that will flower in the following year. If the plant blooms before June the flowers are usually from buds produced the previous year, but if it blooms after June the flowers are usually on new growth produced in the current year. Forsythia is a good example where non-flowering is caused by inappropriate pruning, it is a vigorous grower and the temptation is to trim off all of the outer shoots (the sort of pruning done using a hedge trimmer). It blooms on the growth from the previous year and this removes all of the flowering buds, so the best way to keep it to a reasonable size is to remove complete branches from lower down in the plant. In the case of Forsythia the older branches tend to be 'pimpley' and there is usually different coloured or textured bark on older shoots of many shrubs. This brings us to another rule of thumb when pruning shrubs. Choose one third of the oldest branches and prune them near to the base of the plant. This means that the whole bush is renewed every three years and it never grows to more than the height it can reach in this period. This is the method used for most shrubs, but as with any rule there will always be exceptions and Buddleja davidii is one such plant where all of the branches are cut back close to the base every year to keep a compact bush. Any vigorous, late-flowering shrub which blooms on growth produced in the current year can be cut back hard, eg. Fuchsia. All of the branches of colour-barked Dogwoods are removed close to the base just as the leaves are about to appear to allow fresh shoots to be produced for a colourful show after leaf fall in the autumn. If the prunings are of a reasonable length they can be used as plant supports. Let them dry off for a few weeks otherwise some of them may take root. Good subjects for this are Dogwood and thinings from Willow, Birch or Beech. Variegated shrubs are usually 'sports' where areas of leaf have reduced or absent chlorophyl in the cells - an exception is the Spotted Laurel or Acuba japonica' where the pale blotches are caused by a virus. Some are prone to reverting to plain green so any such branches should be traced back to the main branch where they arise and cut off flush with the stem. If left this reversion will cause more vigorous growth due to the greater level of chlorophyl providing nourishment and take over from the relatively weaker variegated original. Alternatively the paler foliage can dominate and the leaves cannot photosynthesise so these branches will not thrive - this is found in Ilex 'Golden King' and varieties of Euonymus fortunei. 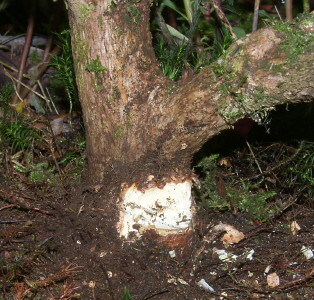 Grafted shrubs are usually growing from a more vigorous root stock and this can produce its own shoots from below the grafting point. These would eventually take over the plant so they too must be removed. 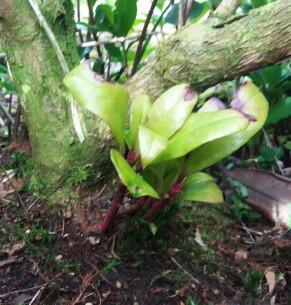 An example of this on a Rhododendron is shown below; the rogue shoots usually have paler green leaves than the grafted ones. 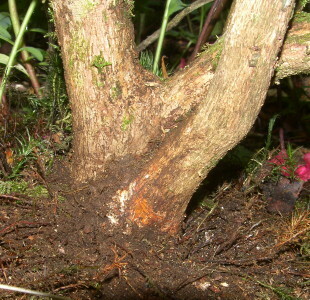 Contorted Hazels and some Viburnums are grafted and any shoots arising from the base which are different from the intended form need to be removed. These are best torn off to leave nothing of the rogue shoot behind which will produce more growth, if this is not possible then trim close to the base. ensure it does not regrow. They have to be removed.